We have a whole bunch of different text items for you to use. Every time you see text in a document it comes packaged in a format which you can edit virtually any way you like. There are essentially two different types of text components, Text boxes and Text panels. Find them in the + Add menu under Text. Find the text panels in the + Add menu under Text Panels. The panels also include items like speech bubbles, sticker and symbol panel shapes and various other useful designs. Again just tap to add to a document. You'll notice that as you hover over the handles (the blobs) you'll see a tip describing its function. 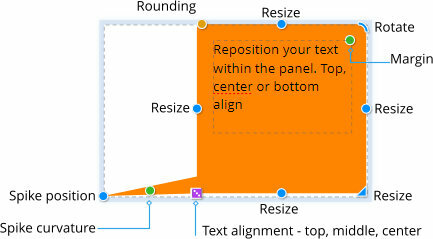 The blue outline indicates that the whole panel is selected and available to be moved. Text editing - that is the editing of the text itself, which includes Text selection, Text styles, Font selection and the Spell checker, is covered in the Text section.